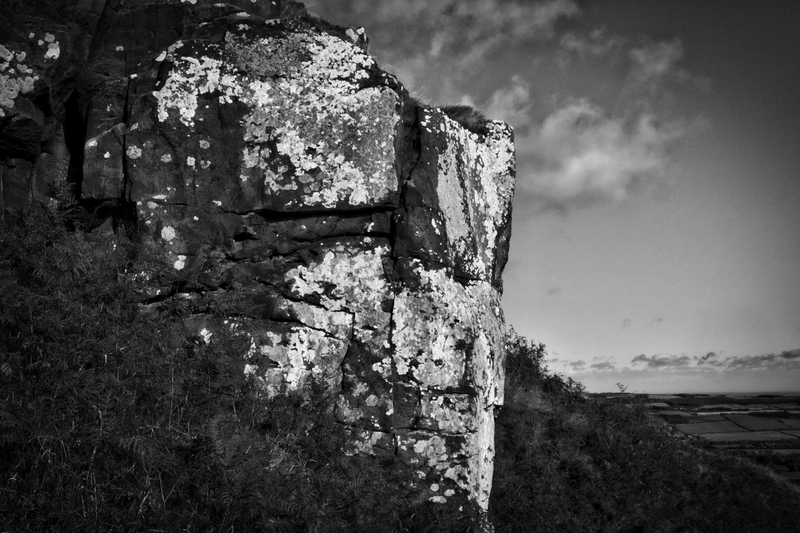 Rendered in black and white this photo contrasts the lichen-covered rocks of Roseberry’s eastern crag. Lichens are everywhere yet are often overlooked. They thrive in a variety of environments, are long-lived with a very slow growth rate but are sensitive to moisture, pH, minerals and air quality. They are actually two organisms, a fungus and an alga, living in close association. The fungus forms the layered structure, with the alga sandwiched between converting sunlight to sugars. The two organisms thus are in a mutually beneficial partnership; a perfect example of symbiosis. Man in his ingenuity has used lichens for a multitude of uses: dyes (it is still used in the manufacture of Harris Tweed), medicines, cosmetics and perfumes as well as food. The Ancient Egyptians even used lichens in their embalming practices.